Contains ultra-high antioxidant level of 11.60% vs 5-6% for mass-market teas. Character: Expansive green tea flavor with delicious vegetative notes. An excellent steamed green tea. Though this tea comes from China it is produced to Japanese specifications on Japanese machinery. The base tea is from single buds only available during March and April - when the best green leaf is produced. To increase the chlorophyll tea bushes are covered with bamboo and straw shading from March 1 to 20th (more or less). The leaves are plucked about 1-2 weeks after the shading comes off. The leaves are small - less than 1 inch but extremely fragrant and tender. 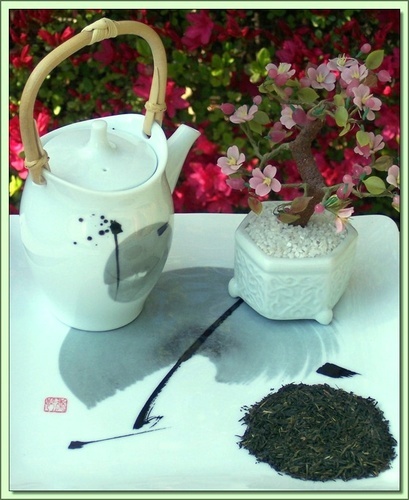 The plucked leaves are gently bruised and then lightly steamed, producing dark green leaves that give a slightly pungent tea with depth and character. Organic tea is produced without the input of chemical fertilizers or pesticides and herbicides. Certified Organic by QMI Organic Inc. Certificate #: 150 - 2008. USDA Certified Organic.